Scientists think that ancestors of sharks lived more than 400 million years ago—about 200 million years before dinosaurs. The main types of sharks living today evolved by 100 million years ago. 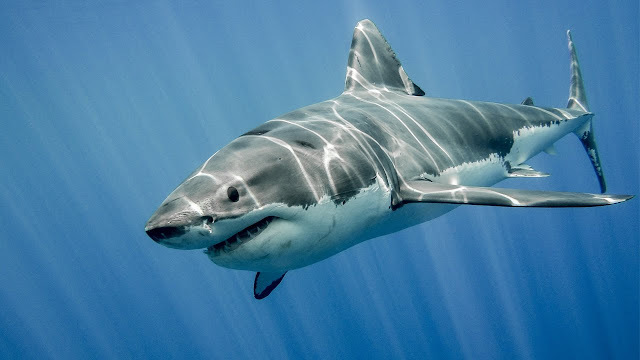 Sharks live in all seven of the world’s oceans, but they’re not confined solely to wide-open bodies of salt water. There are species that can survive in mixed salt- and freshwater environments like estuaries and watersheds that connect to an ocean, while other species can live in completely fresh water. Sharks have complex and varied ways of giving birth to their young. Some lay egg cases, which have been nicknamed “mermaid’s purses” and sometimes wash up on beaches. However, a majority of sharks give live birth, and a female might give birth to as many as 48 pups in one litter. Sharks generally have about 45 to 50 teeth – but that’s just the “front row” teeth. They also have, on average, as many as seven replacement rows of teeth behind the front row, ready to move into place if a tooth is damaged or falls out. With all the action a shark’s mouth sees throughout its lifetime, an individual might go through as many as 30,000 teeth. Even though we associate sharks with big, sharp chompers, some species barely need their teeth. Whale sharks and basking sharks, two of the largest species, are both filter feeders and have numerous, tiny teeth – a whale shark might have up to 300 rows of teeth . While sharks don’t use sounds to communicate, they do rely on body language. If you’re snorkeling or diving, it’s good to be aware of the body language sharks use to communicate that they’re uneasy. Hunched backs, lowered pectoral fins, sharp movements (in zig-zag or back-and-forth patterns), and diving down to touch the bottom are all good indicators that a shark is feeling uncomfortable. Some large sharks have dramatically longer lifespans than small sharks. For instance, whale sharks (which generally range from 18 to 32 feet/5.5 to 10 meters in length) can live up to 100 years, while the smooth dogfish (with an average length between 2 and 4 feet/0.6 and 1.2 meters) might only live for 16 years. Sharks rarely pose a danger to humans. But humans do pose a danger to sharks! Fishermen kill an estimated 30 million to 100 million sharks every year. About 75 shark species are in danger of becoming extinct. Sharks have extremely sensitive hearing. They can identify much lower sounds than human ears can detect, and some can hear sounds more than 700 feet away. Some scientists think hearing is typically the first sense sharks use in detecting their prey. Whale sharks claim the title of largest shark species, and are also the largest species of fish in the world. The basking shark, the second largest shark (and fish), averages between approximately 22 and 29 feet/ 7 and 9 meters. Pygmy Ribbontail Catsharks are perhaps the smallest, at about 6 to 7 inches/ 17 to 18 centimeters . Other small species include the Dwarf Lanternfish and the Spined Pygmy Shark , both of which are roughly the same average size as Pygmy Ribbontail Catsharks. Different sharks have their babies, or "pups," in different ways. Some lay egg cases. Others grow the pups inside of them and give birth to live young. Depending on the species, a shark may give birth to one or to dozens of pups! However it is born, a pup is on its own from the start—the mother shark doesn't stay around to take care of it.